Real Madrid are not over former manager Zinedine Zidane's glory days. The club appointed Julen Lopetegui but the Spanish boss failed to incorporate his philosophy into the team. Now comes Santiago Solari. It was a make-or-break point for the Argentinian caretaker manager. After four wins in a row, he was given the permanent role because La Liga rules dictate no caretaker can serve more than a fortnight. In all, Solari has won 19 matches, lost four and drawn two, the latter including the Copa del Rey semifinal first leg at the Nou Camp against Barcelona, a far more satisfactory result than the decimation in El Clasico that triggered Lopetegui's exit. Solari has improved the squad significantly. Lucas Vasquez and Karim Benzema have found new leases on life. The Clasico result illustrates. Same pitch, same players to choose from, save for Brahim Diaz, but entirely different results. Under Lopetegui, Real lost 5-1. It was shameful. Solari was not only competitive, he gave the Merengues a slight advantage with the away goal in the second leg. By no means was it a result for Madridistas to swoon over but it was a result. Under Zidane, Real were too dependent. All passes led to Cristiano Ronaldo. The Portuguese's immense talent justified the attention. All they had to do was to whip in a cross. Their talisman would find a way to put it in the back of the net. It took some doing but the squad is more balanced. Luka Modric, Toni Kroos and Gareth Bale are all world-class players who can push their team to win alone but with none performing exceptionally well, the manager needed a solution. Solari's was to turn to the youngsters. Having developed his coaching talent at La Fabrica, he is aware of the quality and character his young players possess. Real have no lack of talent. The likes of Dani Ceballos, Vinicius Junior, Alvaro Odriozola and Sergio Reguilon offer it in volume. Solari's trust helped them settle. 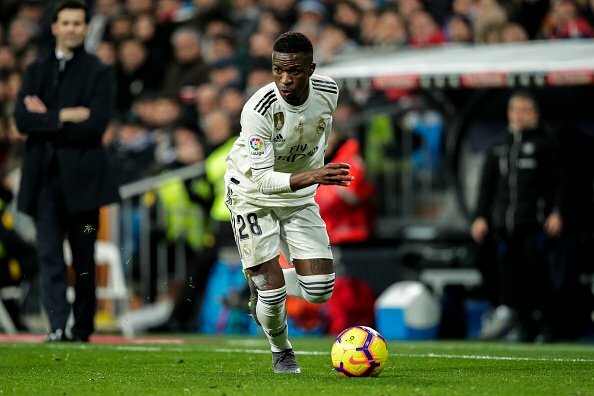 When Vinicius Jr signed for €53 million, Lopetegui sent him to Real Madrid Castilla, the B team. When Solari took over, he instantly upgraded Vinicius, including him in his plans. He knew what Vinicius could do; seeing him scoring four in five games for Castilla side. Considering his age, the 18-year-old is one of the best out there. He has developed the fearless attitude the club thought it would get from Marco Asensio. In El Derbi on the weekend, he continued to test Atletico's defence from the left flank, making run after penetrating run until he forced a desperate foul from Santiago Arias that VAR confirmed occurred inside the box. Sergio Ramos converted. Averaging four dribbles per 90, the former Flamengo winger was a constant threat against Barcelona earlier this week. Although his finishing was erratic, his contribution was satisfying. He's making it difficult for Gareth Bale to crack the starting lineup even though the Welshman came on late at the Wanda Metropolitano to finish off Atleti. Marcos Llorente played zero minutes under Lopetegui. Now, the homegrown product seems indispensable. With Casemiro injured, Llorente showed up and has performed better than expected. He presses well, gets the ball and distributes it forward. Keeping things simple, he recalls Xabi Alonso. He doesn't give into tackles. reads the game intelligently and positions himself exceedingly well. His technical ability adds a dimension Casemiro doesn't usually provide, although his twisting side volley against Los Rojiblancos with the youngster injured suggests, like Bale, he is being forced to up his game. Solari has let Llorente express himself. It's paid off. Sergio Reguilon plays as a left-back. Marcelo, who made the position his home for over a decade is being benched by a 22-year-old. The 31-year-old Brazilian ranks among the world's best left-backs but struggles defensively. He is always higher up the pitch. In turn, he draws Sergio Ramos out of position, creating the space too many opponents began filling. Against Barcelona in the earlier Clasico, it was evident. Malcom and Nelson Semedo destroyed Marcelo. The majority of Barca's attacks originated on the Brazilian's side. With Reguilon, Real are less vulnerable and concede less on counters. He is disciplined but can attack too. Intercepting a pass, he runs good yards and can also launch balls into the box. He is a Marcelo who can defend. The same things can be said for Dani Ceballos, Javi Sanchez, Federico Valverde and Alvaro Odriozola. They all serve as able reinforcements, invigorating the squad. Questions still arise from Asensio and Isco's lack of involvement in the process. Solari is changing the dynamic at the Santiago Bernabeu. Trusting in youth complements well with club President Florentino Perez's ambitions. The transition was long overdue. Solari is making it smoother.